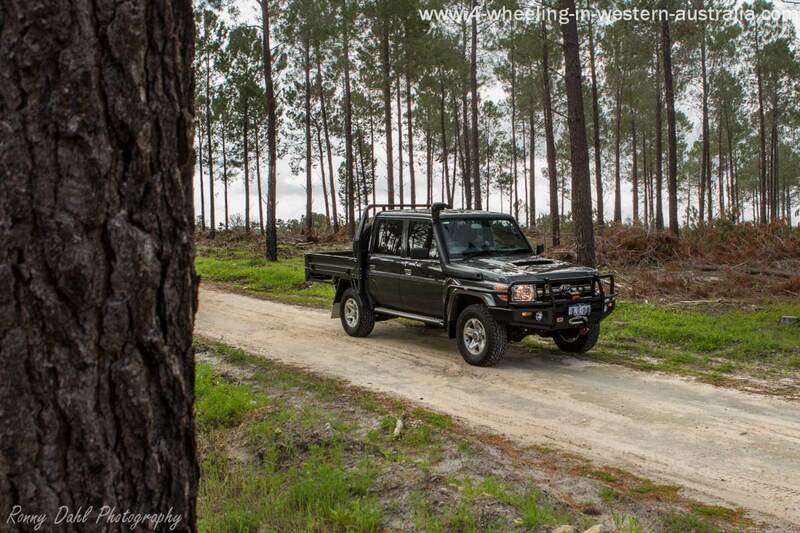 79 series Landcruiser V8 Turbo Diesel Dual cab Ute Review. Due to receiving so many emails and questions on Facebook, YouTube and various 4x4 forums we have created an entire web page and a YouTube video just for the 79 series Landcruiser (VDJR79). We have also made an entire page just on fixes and improvments to the Toyota 70 series Landcruiser, for that page see TOYOTA 70 SERIES FIXES and ISSUES. 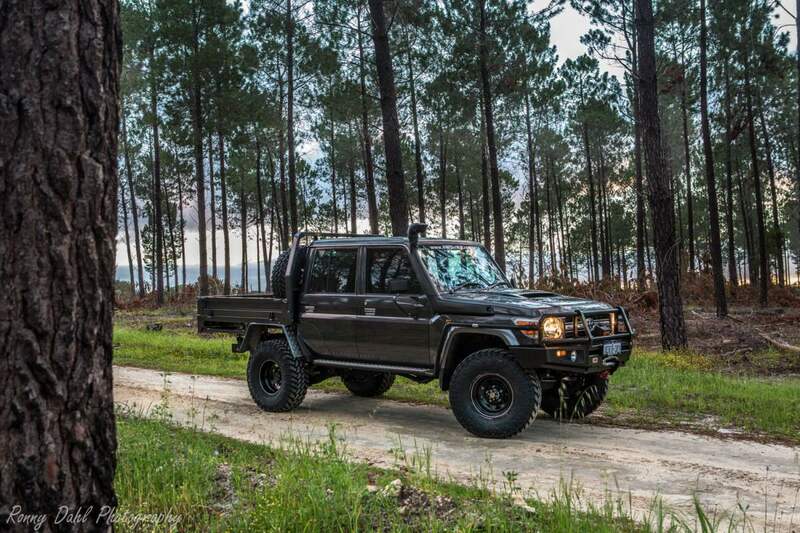 For everything else about the 79 Dual cab cruiser keep reading below. Updated as of AUG 2015! A while ago (2013) we did a short video about my thoughts/review on the 79 series Dual cab and the modifications I have made to it, this video was sparked from emails, YouTube and Facebook posts. Since then a lot has changed, bar work, exhaust, chip tuning, lights and more. So due to this and the many emails we still receive we have done an updated version of this video. When we first uploaded this page to the website I had the 79 series Landcruiser for just 3 months (that was from December 2013, pick up from Toyota dealer Sep 2013), now as of August 2015 I have had the 79 series Landcruiser for nearly 2 years and just in that one year I have taken her to; Lancelin, Mundaring, Bremer bay, Esperance, Julimar, Harvey, Brunswick, Outback stations near Paynes Find, Wedge Island, Grey, Hill river coastal tracks at Cervantes, North Head Jurien bay, Wilbinga, Seabird, Murchison, Blackwood, the steep hills of Nannup & Balingup, D’entrecaste NP, Israelite Bay, Holland track, Gold fields, Adelaide rd, Wellington NP and more that I just can’t think of right now, many of these place more than a few times. It's by far the most torqued vehicle I have ever driven from stock; off road nothing really stops it. On the trip from wedge to Grey I managed to get slightly bogged on the beach, and all I had to do was put it in 1st gear low and just let it pull itself out, that's how much low torque it has! My previous 4wd was Toyota Hilux SR5 Extra cab petrol which I had for over 7 years so comparing the two is like apples and oranges, they are different in so many ways. There was nothing wrong with the extra cab Hilux apart from being too small in the seating department, with a growing family a dual cab was required and I had been eyeing off the 70 series Landcruisers for a long time, so the day they started selling the dual cab 79 series Landcruiser I started saving and waiting. It was not a hard choice to make, given a V8 turbo diesel in a tray back Ute with solid axles, what more could you want?! It sure ticks all my boxes and being a Toyota there was no changing my mind. So far a fair bit has been done to the cruiser and having learnt from the previous vehicles I had I had a modification plan in place. I made plenty of mistakes on the most recent 4x4 (the Hilux), I had to redo most of the setup due to various situations, so a fair bit was learnt about my 4wd setup needs. It really saves you money to stop and really think about what mods you need and more importantly how you need the 4x4 setup in every aspect of 4 wheel driving, touring and camping! I knew exactly what I wanted to do and so far this 79 series Landcruiser is setup exactly how I would like it and the canopy is coming along well with still a fair bit of DIY work to be done. The upgrade in bar work on the 79 Series Landcruiser! The boys at Opposite Lock in Wangara were my 'go to place' for accessories whenever we needed some, always friendly and very helpful. After visiting a fair few times they showed me some new bar work which O/L had just developed and I just loved the look of that bar work for the 70 series, it suits the cruiser better than any other bar work I have seen (in my opinion of course). So what do I think is so good about the new design 70 series O/L bar work? Well firstly I think it looks the part, with 63mm tubing at every rail & post it looks really tough and robust. Really suits the 70 series Landcruiser look! Not many people have this yet as it is very new so the cruiser looks a bit more unique. Compared to the previous bar (ARB bar) it doesn’t have that extra rail along the bottom which has now allowed me to put some big spotties at the front which wouldn’t have fitted before. Let me make it clear that there is nothing wrong with the ARB bar-work, it is strong and well built. I just preferred the look of the O/L bar work and I wanted a different looking cruiser rather than the same bar work everyone else had. The exhaust upgrade (installed and supplied at Opposite Lock)! The exhaust has now been upgraded from a single 3’ to a twin 3’ inch Red back exhaust, the cruiser sounds unreal & breathes very well, combined with the unichip she will be unstoppable on the sand dunes and the torque is huge. Idling up rocks and steep hills is a breeze and even after loading the 79 series LandCruiser up for a trip I don’t notice the extra weight when driving. Previously I had a cheap Chinese LED bar on the front, it kind of did the job but after a while it started to fade into a light brown colour; the plastic light cover became a milky white and was blocking the luminums emitted from the light bar. Well you get what you pay for! Just recently Altronics got their first shipment of LED lights in (after testing many for a very long time in the Australian conditions); I managed to get a few from their second shipment before they sold out. The LED’s in these lights are a whopping 10watts each! I pulled off the old light bar and replaced it with 2 100watt LED bar lights and WOW! So much more light with less LED’s! I also got 2 smaller LED lights for the rear which I use for lighting up the ground behind me during night driving, this comes in really handy when reversing and rock crawling. 9 months after have the Unichip Q+ I upgraded to the Unichip Q4 with the help of Travis from SS Auto Repairs. 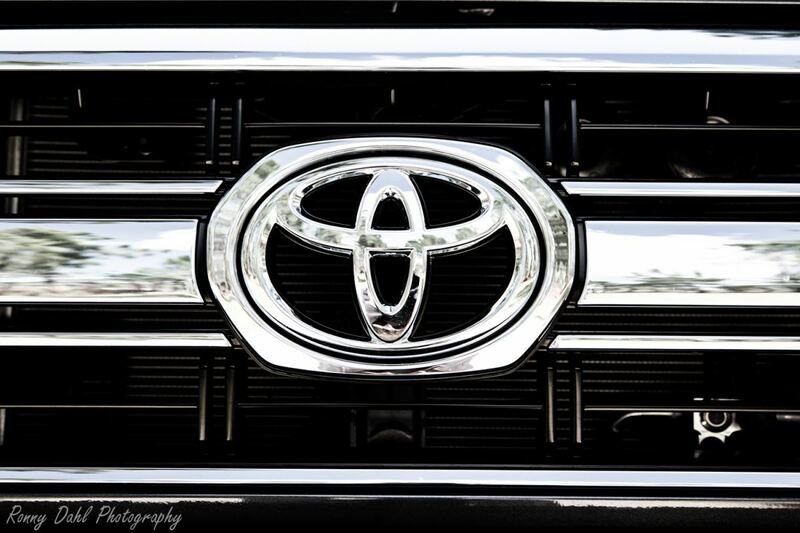 As most other Toyota’s and some other vehicles when they are released from factory they are very under powered which is also why they are so reliable, but there is plenty of ‘safe’ power gains to have from your Toyota 70 series diesel motor. With the correct power/torque chips (in my case the Unichip Q4) and the right person to ‘LIVE’ tune it on an actual dyno, there is so much locked power, torque to gain. Not only that, the engine & Exhaust temperature, fuel consumption and drivability have dramatically improved. 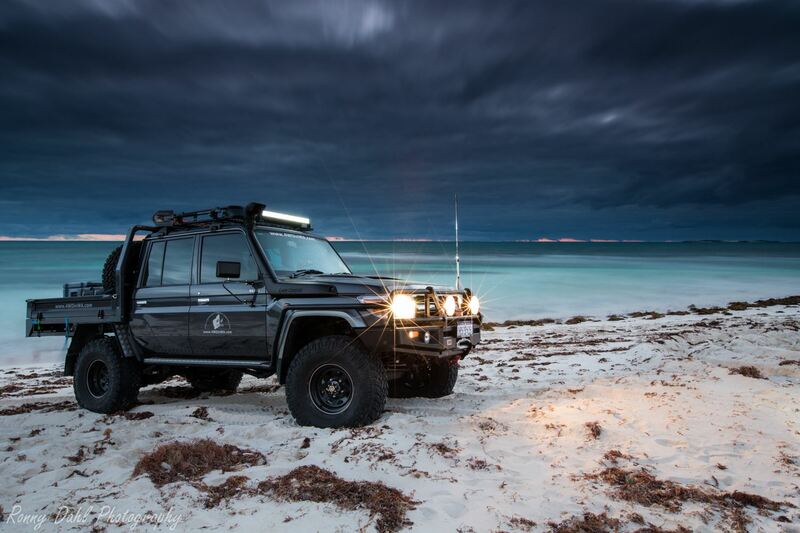 For Information About The Unichip Q4 In The 70 series LandCruiser See Here. There are so many accessories available for the 70 series and everyone so far who has worked on my cruiser have said how easy and enjoyable it is to work on them as everything has been kept simple, nearly the entire interior just clips apart carpet and all. Being able to fit 35 inch tyres with just a lift kit is quite amazing considering most modern 4x4s are very limited when it comes to wheel size. This is mostly due to IFS vehicles, which require cutting into the guards and even body work. The engine bay is the most technical area however the rest of the vehicle has been kept very basic and similar to previous 70 series. The 79 series Landcruiser is surprisingly comfy, I was considering changing the front seats with an aftermarket one and those thoughts are now far from my mind. If a heavily pregnant women sits in the front seat for a long 500+ km trip and says the seats are fine then the seats are bloody good! Space on the rear seats is pretty much the same as any other dual cab on the market; however the windows are so big on the 70 series and combined with the rear seat height compared to the window kids absolutely love it as they have a huge window to look out of. It’s been 2 years and many km/miles of off-roading and highway driving and I still find the cruiser very comfy. I rate the seats better than my previous Toyota Hilux. 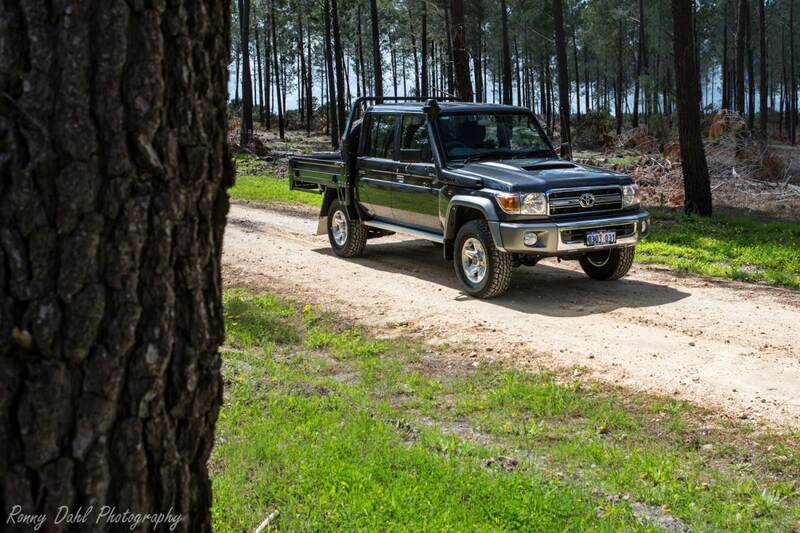 The 79 series Landcruiser is produced mainly for mining, farming and towing purposes, however the V8 turbo diesel ute makes for the perfect base platform for the ultimate 4wd tourer, exploring vehicle or just a tough weekend warrior. With the Custom Canopy now installed and the inside nearly completed, the Cruiser is now what I consider to be my complete touring, camping and Tough Trail 4 Wheel Drive. Even with such a sizable box on the rear it is very light weight mainly due to being constructed out of alloy and with some careful design I managed to strategically place weight in opposing sides and most of that close to the cab. Having one spare right up against the driver side cab and the fridge on the passenger side it keeps it close to the centre of the vehicle. The only heavy item at the rear is the second spare. 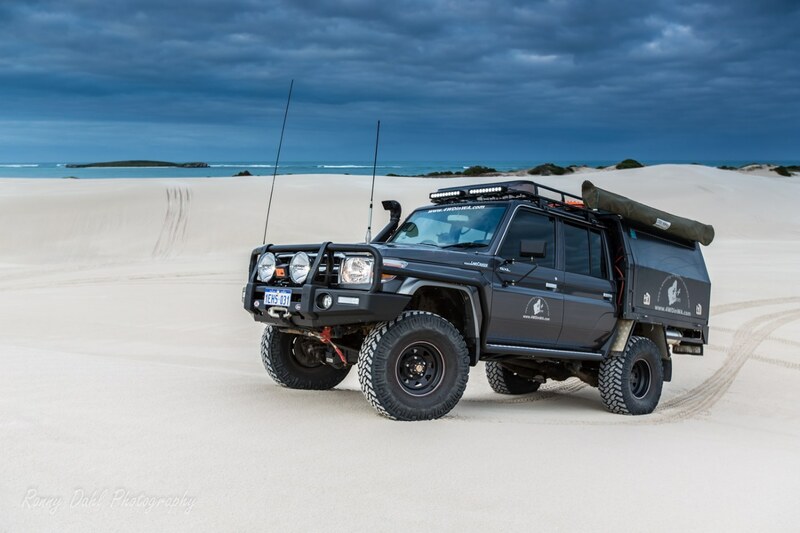 A few short camping trips have been done with the custom box, having it loaded from the base to the ceiling including a 25 kg tent on the roof of the canopy the 79 Series Landcruiser only sagged 10-15 mm at the rear. All the electrics have been done by myself, at first I was a bit worried if I'd get it done right as the electrics plan was huge, but found it quite easy once I just focused on one task at a time. An overall plan still needs to be thought up as the right size wires and the amount of wires from the second battery to the rear can limit what can be added later. Another big thing was getting the correct size fuses and keeping wires the same size from the power board to the electrical lights or plugs. Get these things right and it’s just a matter of following switch diagrams and putting positive to positive and negative to negative. Most of the electrical items used were from Altronics, they have pretty much everything in one place which saves time and money. Now to the awning, it’s an Ostrich wing awning. What I love about this awning is the amount of shade it provides with such little effort in the setup procedure. It's nearly just a 30 sec job once you have pulled it out a few times and know the procedure. Another great thing to point out is that once the ostrich wing is pulled out and I find that I have picked a bad spot in relation to the sun light direction I can just jump in the cruiser and move with the Ostrich wing still out and getting the shade spot on! This is due to not needing to use ropes unless it’s really windy. Is the 79 Series LandCruiser completed? There is always room for improvement and like a lot of us 4 Wheelers our 4 Wheel Drives are always a work in progress, there is always a new gadget or new idea floating about which we just can't help but add to the vehicle. After all it’s our life style and our 4x4's give us joy by enabling us to get to places others can't get to. Well the update of SEP 2014 really states that no 4WD build is ever complete, there is always something to add no matter how big or small the improvement is! Stage 3: Lift & Tyres. Stage 4: Lights and Storage Solutions. Stage 5: The facelift with the help from Opposite Lock 4x4. Thanks for reading, any other questions or comments please post below. 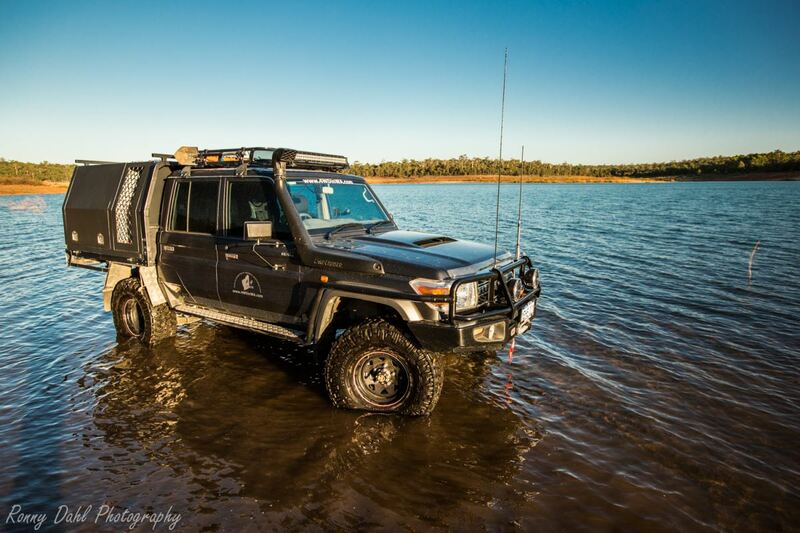 A self-proclaimed Landcruiser and off road nut! See Also Toyota 70 Series Landcruiser Fixes & Solutions. 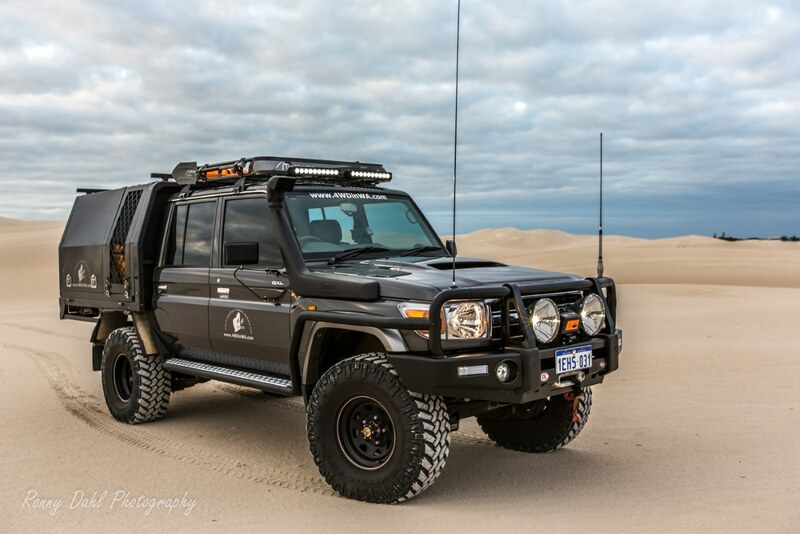 Leave 79 Series LandCruiser And Go 4-Wheeling-In-Western-Australia.